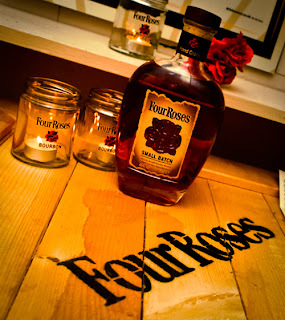 "It does brand you in the face a bit," says my friend Rob as we sit on a wooden crate in the amber glow and hidden warmth of the Four Roses ‘Hide&Speak’ pop-up bar. 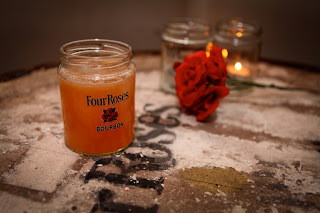 I nod, my eyes traveling over the walls covered in burlap sacks, the barrels functioning as tables, the candle holders, pillows and wall posters, all brandishing the Four Roses name brand. It's cosy but, as Rob mentions, a bit much. We've stumbled in from the freezing February weather and down a set of creaky wooden stairs to a room below the rammed room upstairs in Shaker & Company, the cool bar in Camden. The Four Roses pop-up bar is only around for a month so my cocktail-loving PR friend was eager to check it out with me. We manage to find a seat in the crowded den, which is more of a wooden bunker than a speakeasy. I'm wondering where the piano is, where the men in bowler hats are. I leave my friend to hold our places and stand in the queue at the bar. I’m excited by the prospects of the quirky looking cocktails that I've noted are being shaken up by the sole chap behind the compact bar. There are only four people in front of me but it takes 25 minutes to get served. Suddenly, I'm not so enthused by quirky cocktails. At £9 a pop, I don't know that many would be thrilled. "You know how to show it when you're not pleased, don't you," says Rob, as he comes to stand beside me and keep me company. It's true; I'm pouting; it's been a long week and I had high expectations for a new hidden bar, but I soon realise I'm not being fair. It's the bar's first night. There are always bound to be teething problems. I bet it'll be lovely in a couple of day's time. Then we lose our seats. In a place as cramped as this, I find myself huffing at the thought of standing by a large barrel after 25 minutes of waiting for a cocktail which is nice, but nothing to write home about. Rob sees my expression and tries to pep me up offering to brave the queue once more to get us something different. As I stand on my own, trying to look less like the grumpy Gus I feel, I notice it's only me who is dark in mood. Everyone else seems to be laughing and chatting in small groups, discussing their days and "Ooohing" and "Aaahhing" over the cocktails. I decide to bring myself into a positive frame of mind, hoping it will bring about good things. And then a ‘table’ opens up. "Ah, this positive thinking does work," I exclaim to myself, quietly enough that people won't think I've over-bourboned myself this early in the evening. Soon enough, my friend comes wandering over carrying what can only be categorised as an Alice in Wonderland teapot. It's steaming and foaming, shooting puffs of white clouds out of its neck and lid. Plopping it down on the barrel, I scooch over so we can share the crate. "There's nothing like the wrongness of an iced-over teapot," says Rob. 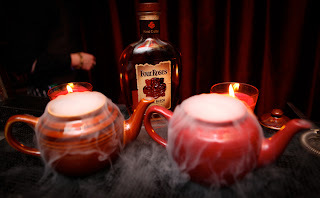 True to his word, Rob notes frozen chunks of ice forming along the outside of the teapot, an effect of the dry ice which is creating a spectacular scene before my eyes. The cocktail isn't just all show either; made from Four Roses Small Batch bourbon, lemon juice, green tea syrup, cardamom and mint, it's delicious. Punchy enough to keep the bourbon biting, but softened by the thick flavours of the green tea and cardamom, it rolls around in the tongue and goes down too easily. "People will order it because it's a novelty and as a side effect, they're getting the best drink," adds Rob, scraping bits of ice and watching them melt away. As we sip down the drink, I feel a little more impressed. But the ubiquitous Four Roses branding does take away a bit of the Prohibition feel. It's more like an advertisement that Don Draper would drool over than a hidden bar that harks back to a secret era of gangsters, spiffs and smoking, drunk writers. Still, I'm dreading going back out into the cold. If anything, the ‘Hide&Speak’ is a warm and lively hideaway that will suit those who love something a bit different after a long day at work. 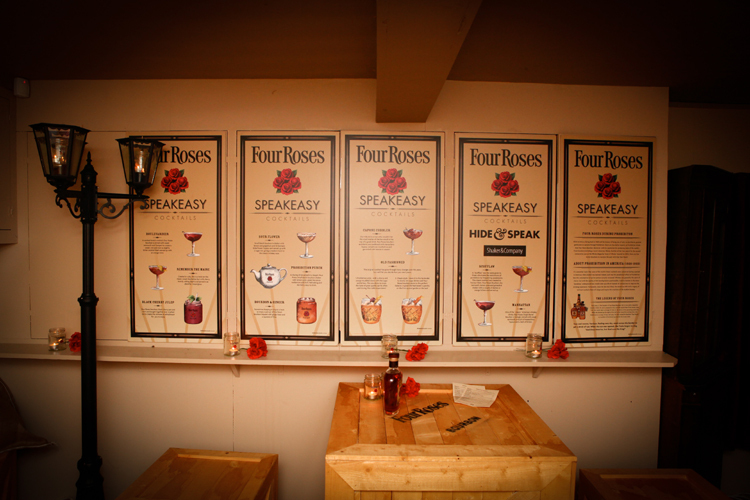 The Shaker & Company Four Roses pop-up "Hide&Speak" is open until the 29 February at 119 Hampstead Road, NW1 3EE from 5pm until late.